For the professor of Jewish studies, see Aaron W. Hughes. 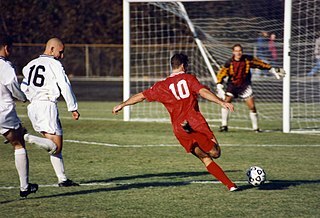 The Scottish Premiership, known for sponsorship reasons as the Ladbrokes Premiership, is the top division of the Scottish Professional Football League (SPFL), the league competition for men's professional football clubs in Scotland. The Scottish Premiership was established in July 2013, after the SPFL was formed by a merger of the Scottish Premier League and Scottish Football League. Sixteen clubs have played in the Scottish Premiership since its creation in the 2013–14 season. Celtic are the current league champions, being the only league champion to date since its establishment. Heart of Midlothian Football Club, commonly known as Hearts, is a Scottish professional football club based in the Gorgie area of Edinburgh, Scotland, that plays in the Scottish Premiership, the top tier in Scottish football. Hearts are the oldest football club in the Scottish capital, as they were formed in 1874 by a group of friends from the Heart of Midlothian Quadrille Assembly, whose name was influenced by Walter Scott's novel The Heart of Midlothian. The modern club crest is based on the Heart of Midlothian mosaic on the city's Royal Mile and the team's colours are predominantly maroon and white. He began his career with Newcastle United, making his debut in 1997 and playing 279 games for the club across all competitions. He remained with the club until 2005, when he was transferred to Aston Villa for £1 million, and two years later he was signed by his former international manager Lawrie Sanchez to play for Fulham. He spent six-and-a-half seasons at Fulham, reaching the UEFA Europa League final in 2010. After leaving the club in January 2014, he had brief spells in the Championship with Queens Park Rangers and Brighton & Hove Albion, and abroad with Melbourne City FC and Kerala Blasters FC. Lawrence Philip "Lawrie" Sanchez is a Northern Irish football manager and former international football player. Fulham Football Club is a professional association football club based in Fulham, West London, England. Founded in 1879, they currently compete in the Premier League, the top tier of English football. They are the oldest football club from London to play in the Football League. Hughes made his full international debut aged 18 in 1998 and has earned 110 caps for Northern Ireland, the second most in the nation's history, behind goalkeeper Pat Jennings. He captained the national team from 2003 up to international retirement in 2011, but returned to the team the following year and was included in their squad for UEFA Euro 2016. Patrick Anthony Jennings is a Northern Irish former footballer. He played 119 games for Northern Ireland as a goalkeeper, a figure which at the time was a world record and is still a Northern Ireland record, in an international career which lasted for over 22 years. During his career Jennings played for Newry Town, Watford, and in the top division with Tottenham Hotspur and Arsenal, winning the FA Cup with both of the north London rivals. In total, Jennings made over 1,000 top level appearances, and despite being a goalkeeper he scored in the 1967 FA Charity Shield. Born in Cookstown, County Tyrone, Hughes came through the ranks at Newcastle United. He made his first team debut in the Camp Nou in a match between Newcastle and Barcelona on 26 November 1997, replacing Philippe Albert at half-time in a 1–0 UEFA Champions League defeat. His league debut came against Sheffield Wednesday on 10 January 1998, playing the entirety of a 2–1 defeat at Hillsborough. Although he featured in the earlier rounds, including the semi-final against Tottenham Hotspur at Old Trafford in the latter campaign as a 36th-minute replacement for the injured Steve Howey,  Hughes was not included in Newcastle's squads for their FA Cup Final defeats in 1998 and 1999. Cookstown is a town and townland in County Tyrone, Northern Ireland. It is the fourth largest town in the county and had a population of 22,838 in the 2011 census. It is one of the main towns in the area of Mid-Ulster. It was founded around 1620 when the townlands in the area were leased by an English ecclesiastical lawyer, Dr. Alan Cooke, from the Archbishop of Armagh, who had been granted the lands after the Flight of the Earls during the Plantation of Ulster. It was one of the main centres of the linen industry West of the River Bann, and until 1956, the processes of flax spinning, weaving, bleaching and beetling were carried out in the town. County Tyrone is one of the six counties of Northern Ireland and one of the thirty-two counties on the island of Ireland. It is no longer used as an administrative division for local government but retains a strong identity in popular culture. Ruud Gullit, OON is a Dutch football manager and former footballer who played professionally in the 1980s and 1990s as a midfielder or forward. He was the captain of the Netherlands national team that was victorious at UEFA Euro 1988 and was also a member of the squad for the 1990 FIFA World Cup and Euro 1992. Sir Robert William Robson was an English footballer and football manager. His career included periods playing for and later managing the England national team and being a UEFA Cup-winning manager at Ipswich Town F.C. Kieron Courtney Dyer is an English former professional footballer who played as a midfielder. The 2001 UEFA Intertoto Cup finals were won by Aston Villa, Paris Saint-Germain and Troyes. All three teams advanced to the UEFA Cup. The UEFA Intertoto Cup, originally called the International Football Cup, was a summer football competition for European clubs that had not qualified for one of the major UEFA competitions, the Champions League, the UEFA Cup and until 1999, the Cup Winners' Cup. The competition was discontinued after the 2008 tournament. Teams who originally would have entered the Intertoto Cup now directly enter the qualifying stages of the UEFA Europa League from this point. On 20 May 2005, Hughes was sold to fellow Premier League side Aston Villa for a fee of £1 million, on a three-year contract. He made his debut on 13 August, as they began the season with a 2–2 draw against Bolton Wanderers at Villa Park, all four goals coming in the first nine minutes. During his time in the West Midlands, he made 64 appearances in all competitions for his club. 2011–12 appearances includes match in Europa League, away to Dnipro on 25 August 2011, which is currently not included on Soccerbase website. Stephen Michael David Kelly is an Irish professional footballer who last played for Championship club Rotherham United. He plays as a defender, primarily at right back. He was part of the team that secured the Republic of Ireland's qualification for UEFA Euro 2012. Richard James Michael Stearman is an English professional footballer who plays as a defender for Championship club Sheffield United. He is a versatile defender, being able to play in any defensive slot although primarily a centre half or right back. Steven James Sidwell is an English former professional footballer who played as a midfielder. Kevin David McDonald is a Scottish professional footballer who plays as a midfielder for Premier League club Fulham. Aaron Thomas Wilbraham is an English professional footballer who plays as a forward for Rochdale. James Trevor Berrett is a professional footballer who plays as a midfielder for FC Halifax Town. 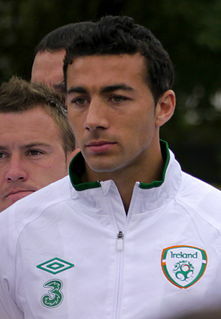 He played for the Republic of Ireland national under-21 team. Barry Christopher Roche is an Irish professional footballer who plays for Morecambe in League Two as a goalkeeper. He is a former Irish Under-21 international. Aaron William Cresswell is an English professional footballer who plays as a left back for Premier League club West Ham United and the English national team. Jack Grimmer is a Scottish professional footballer who plays as a defender for League One club Coventry City. Cyrus Sylvester Frederick Christie is a professional footballer who plays as a defender for Premier League club Fulham and the Republic of Ireland national team. Aaron Frank Mooy is an Australian professional footballer who plays as a midfielder for Premier League club Huddersfield Town and the Australian national team. Joseph Edward Bryan is an English professional footballer who plays as a left-back for Premier League side Fulham. He is also capable as a left-sided midfielder and left-sided wing-back. He has also had loan spells with Bath City and Plymouth Argyle. A product of Bristol City's youth academy, consistently excellent performances on the pitch have led to Bryan being hailed as one of the academy's best success stories. Aaron Jordan Pierre is a professional footballer who plays as a defender for League Two club Northampton Town and the Grenadian national team. He began his career in the academy at Premier League club Fulham, before joining League One club Brentford in 2011. Conor James Washington is a footballer who plays as a striker for Sheffield United in the Championship and the Northern Ireland national team. Harrison James Reed is an English professional footballer who plays as a midfielder for Championship side Blackburn Rovers on loan from Southampton. Liam Francis Peadar Donnelly is a Northern Irish footballer who plays as a defender for Scottish Premiership club Motherwell. Emerson Schellas Hyndman is an American soccer player who plays for AFC Bournemouth, and the United States national team. Hyndman, who plays as a midfielder, has also previously played for Fulham, Rangers and Hibernian. 1 2 Hugman, Barry J., ed. (2009). The PFA Footballers' Who's Who 2009–10. Edinburgh: Mainstream Publishing. ISBN 978-1-84596-474-0. ↑ "Premier League Player Profile". Premier League. Archived from the original on 1 February 2014. Retrieved 19 January 2014. ↑ "Records on the cards". Skysports.com. ↑ "List of players with the most appearances in the Premier League". Premier League. Retrieved 19 January 2014. ↑ "Confirmation Hughes has still never been sent off". ESPN FC. Retrieved 19 January 2014. ↑ "Shearer puts Newcastle in final". BBC Sport. 11 April 1999. Retrieved 2 June 2015. ↑ "Shearer's five star day". BBC Sport. 19 September 1999. Retrieved 2 June 2015. ↑ "Dyer dazzler lights up drab contest". BBC Sport. 19 March 2000. Retrieved 2 June 2015. ↑ "Toon take Intertoto lead". BBC Sport. 25 July 2001. Retrieved 2 June 2015. ↑ Walker, Michael (21 August 2001). "Robson swiftly sunk by Troyes tempest". The Guardian. Retrieved 2 June 2015. ↑ "Magpies edge past Posh". BBC Sport. 27 January 2002. Retrieved 2 June 2015. ↑ "Newcastle crash out". BBC Sport. 27 August 2003. Retrieved 18 September 2018. ↑ "Hughes completes switch to Villa". BBC News. 20 May 2005. ↑ "Aston Villa 2–2 Bolton". 13 August 2005. Retrieved 2 June 2015. ↑ "NI skipper Hughes in Fulham move". BBC News. 27 June 2007. ↑ "Hughes signs". Fulham Official Website. 27 June 2007. Retrieved 16 April 2014. ↑ "Hughes signs new deal". Fulham Official Website. 4 December 2009. Retrieved 16 April 2014. ↑ "Fulham 1 – 3 West Ham". BBC. 26 December 2010. Retrieved 19 April 2012. ↑ "Fulham 3 – 0 Dnipro". BBC. 18 August 2011. Retrieved 19 April 2012. ↑ "Aaron's Extension". Fulham FC. Retrieved 14 September 2012. ↑ "Man Utd 4 – 1 Fulham". BBC. 26 January 2013. Retrieved 1 December 2013. 1 2 "Queens Park Rangers sign Aaron Hughes from Fulham on short-term deal" (Evening Standard). 31 January 2014. Retrieved 11 October 2014. ↑ Fletcher, Paul (24 May 2014). "Derby 0–1 QPR". BBC Sport . Retrieved 11 October 2014. ↑ "QPR: Andrew Johnson and Aaron Hughes head summer clear-out". BBC Sport . 2 July 2014. Retrieved 11 October 2014. ↑ "Aaron Hughes: Brighton sign experienced defender". British Broadcasting Corporation. 14 July 2014. ↑ "Brighton 0–1 Sheff Wed". BBC Sport. 9 August 2014. Retrieved 1 June 2015. 1 2 "Northern Irish record-breaker Aaron Hughes seeks regular club action". Herald Scotland. 1 June 2015. Retrieved 1 June 2015. ↑ "Aaron Hughes and Paddy McCourt to leave Brighton". BBC Sport. 27 April 2015. Retrieved 1 June 2015. ↑ "Melbourne City FC Signs Aaron Hughes". Melbourne City F.C. 13 July 2015. Retrieved 13 July 2015. ↑ "REPORT: ADELAIDE UNITED 2–4 MELBOURNE CITY". Melbourne City F.C. 5 November 2015. Retrieved 6 November 2015. ↑ "Western Sydney Wanderers thump Melbourne City 3–0 in A-League clash at AAMI Park". ABC. 13 November 2015. Retrieved 13 November 2015. ↑ "A-League Review: Brisbane Roar move top, Sydney held at Melbourne City". FourFourTwo. 2 January 2016. Retrieved 2 January 2016. ↑ "Melbourne City FC Player Update". Melbourne City FC. Retrieved 28 April 2016. ↑ "Northern Ireland's Hughes joins Indian club Kerala Blasters". BBC Sport. BBC. 28 July 2016. Retrieved 28 July 2016. ↑ Charles, Andy (28 July 2016). "Aaron Hughes joins Kerala Blasters as marquee player and captain". Sky Sports. ↑ Parasar, Swapnaneel (1 October 2016). "Indian Super League: NorthEast United 1–0 Kerala Blasters – Katsumi Yusa wins it for Highlanders". Goal.com. Retrieved 20 November 2016. ↑ "Kerala Blasters stay in the race for semi-finals: As it happened". Indian Express. 25 November 2016. Retrieved 20 December 2016. ↑ Sarkar, Dhiman (18 December 2016). "Atletico de Kolkata crowned ISL 2016 champions after beating Kerala Blasters FC". Hindustan Times. Retrieved 20 December 2016. ↑ "Aaron Hughes: Hearts sign Northern Ireland defender & Lennard Sowah". BBC Sport. BBC. 9 January 2017. Retrieved 9 January 2017. ↑ Lindsay, Clive (22 January 2017). "Raith Rovers 1–1 Heart of Midlothian". BBC Sport. Retrieved 8 September 2017. ↑ "Hearts: Defender Aaron Hughes tips Jambos for period of success after signing deal". BBC Sport. BBC. 5 May 2017. Retrieved 5 May 2017. 1 2 3 "NI skipper Aaron Hughes retires from international duty". BBC Sport. BBC. 24 September 2011. Retrieved 3 October 2011. ↑ "Aaron Hughes ruled out of Northern Ireland qualifiers". BBC Sport. BBC. 3 October 2011. Retrieved 3 October 2011. ↑ "Hughes Announcement". Fulham FC. Retrieved 19 January 2014. ↑ Jackson, Lyle (29 February 2012). "Northern Ireland 0–3 Norway". BBC Sport . Retrieved 11 October 2014. ↑ Wheeler, Chris (4 June 2014). "Slovakia 0–0 Northern Ireland: Kyle Lafferty in injury scare after Aaron Hughes comes on for 100th cap". Daily Mail. Retrieved 4 June 2016. ↑ Hunter, Andy (16 June 2016). "McGinn's late goal confirms Northern Ireland's famous win over Ukraine". The Guardian. Retrieved 16 June 2016. ↑ "Father's hopes for 'football fairytale'". News Letter. 12 May 2010. Retrieved 26 June 2016. ↑ Beacom, Steven (24 June 2016). "Family man Aaron Hughes is having time of his life on the big stage". Belfast Telegraph. Retrieved 26 June 2016. ↑ "Games played by Aaron Hughes in 1996/1997". Soccerbase. Centurycomm. Retrieved 9 January 2018. ↑ "Games played by Aaron Hughes in 1997/1998". Soccerbase. Centurycomm. Retrieved 9 January 2018. ↑ "Games played by Aaron Hughes in 1998/1999". Soccerbase. Centurycomm. Retrieved 9 January 2018. ↑ "Games played by Aaron Hughes in 1999/2000". Soccerbase. Centurycomm. Retrieved 9 January 2018. ↑ "Games played by Aaron Hughes in 2000/2001". Soccerbase. Centurycomm. Retrieved 9 January 2018. ↑ "Games played by Aaron Hughes in 2001/2002". Soccerbase. Centurycomm. Retrieved 9 January 2018. ↑ "Games played by Aaron Hughes in 2002/2003". Soccerbase. Centurycomm. Retrieved 9 January 2018. ↑ "Games played by Aaron Hughes in 2003/2004". Soccerbase. Centurycomm. Retrieved 9 January 2018. ↑ "Games played by Aaron Hughes in 2004/2005". Soccerbase. Centurycomm. Retrieved 9 January 2018. ↑ "Games played by Aaron Hughes in 2005/2006". Soccerbase. Centurycomm. Retrieved 9 January 2018. ↑ "Games played by Aaron Hughes in 2006/2007". Soccerbase. Centurycomm. Retrieved 9 January 2018. ↑ "Games played by Aaron Hughes in 2007/2008". Soccerbase. Centurycomm. Retrieved 9 January 2018. ↑ "Games played by Aaron Hughes in 2008/2009". Soccerbase. Centurycomm. Retrieved 9 January 2018. ↑ "Games played by Aaron Hughes in 2009/2010". Soccerbase. Centurycomm. Retrieved 9 January 2018. ↑ "Games played by Aaron Hughes in 2010/2011". Soccerbase. Centurycomm. Retrieved 9 January 2018. ↑ "Games played by Aaron Hughes in 2011/2012". Soccerbase. Centurycomm. Retrieved 9 January 2018. ↑ "Games played by Aaron Hughes in 2012/2013". Soccerbase. Centurycomm. Retrieved 9 January 2018. 1 2 "Games played by Aaron Hughes in 2013/2014". Soccerbase. Centurycomm. Retrieved 9 January 2018. ↑ "Games played by Aaron Hughes in 2014/2015". Soccerbase. Centurycomm. Retrieved 9 January 2018. ↑ "Games played by Aaron Hughes in 2015/2016". Soccerbase. Centurycomm. Retrieved 9 January 2018. ↑ "A. Hughes". Soccerway. Perform Group. Retrieved 9 January 2018. ↑ "Games played by Aaron Hughes in 2016/2017". Soccerbase. Centurycomm. Retrieved 9 January 2018. ↑ "Games played by Aaron Hughes in 2017/2018". Soccerbase. Centurycomm. Retrieved 9 January 2018. ↑ "Aaron Hughes". National Football Teams. Benjamin Strack-Zimmerman. Retrieved 11 October 2016. ↑ "Aaron Hughes". Irishfa.com. Archived from the original on 17 August 2011. Wikimedia Commons has media related to Aaron Hughes .